Since people call China's growth since 1978 a miracle, I decided to study at the Institute for South-South Cooperation and Development in Beijing because I need to understand what lessons from China can be applied to my home country, Liberia, and to other African countries. What policies can be used to help emancipate people from a dragnet of poverty and improve their standard of living? What policies has China used to create consistently high growth rates, averaging 9.85 percent annually, over such a long period of time? How effective are those policies? What is the sustainability of those policies? If successful, how can such policies be adapted to an African setting to help alleviate some of the major economic challenges that we face? China did not apply the "Washington consensus" policies of rapid marketization and privatization long advocated by the World Bank, the International Monetary Fund and other international organizations. It is now better off than the countries that applied these growth strategies. From Nigeria to Liberia to Ghana to Latin America, these policies have not led to sustained growth. Why did the nations that applied the Washington consensus fail, and why did a country that did not apply these policies succeed? I came to China to study whether the Washington consensus or "socialism with Chinese characteristics" or some other political prescription can be used to treat developing countries for the diseases of poverty and economic stagnation. I took advantage of the opportunity to broaden my intellectual horizons. Earlier, I went to university in Liberia, and then had the opportunity to study at the University of Maryland School of Public Policy. Now I'm in China. This triangular academic experience is intended to help me explore solutions to some of the major challenges that confront developing countries, especially in Africa. China's large investment in research and development, amounting to more than 2 percent of GDP, is practically and visibly seen through the level of infrastructure development, the construction of superhighways and modern industries as well as the production of energy-efficient vehicles. Its "new normal" for economic growth is to increase productivity through technological advancement, especially in the service sector. As a means of expanding its developmental trajectory to other parts of the world, China has adopted the Belt and Road Initiative. Simply put, it's a trade and investment program that helps expand China's economic growth corridors while at the same time bringing shared prosperity to other nations along the route. From Indonesia to Russia and from Ethiopia to Tanzania, this network of connections opens trade and diplomatic opportunities. It affirms the principle that peace through harmonious means can easily be achieved by adopting friendly relationships with neighbors. This sort of economic initiative also validates the maxim that states that "countries that trade together are less likely to go to war". In the absence of peace, there cannot be development. Liberia is currently getting a lot of support from China in terms of infrastructure. Some are gifts to the Liberian people; for example, the addition to the legislature and a new ministerial complex are gifts from China. Much work is being done under the auspices of the Forum on China-Africa Cooperation. It is a mixture of infrastructure development, in terms of loans at low interest rates, and industrial cooperation, in terms of manufacturing. We are now trying to put regulations in place to ensure that foreign direct investment takes import substitution into consideration. Most of the intermediate goods that can be produced in Liberia will be produced, in terms of semi-finished products. We don't want to be involved just in the export of natural resources; we want to transform them into finished products so that we can add value. 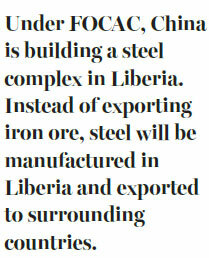 Under FOCAC, China is building a steel complex in Liberia. Instead of exporting iron ore, steel will be manufactured in Liberia and exported to surrounding countries. Natural resources will be converted into a finished product. The influence of China in the development in Africa is enormous. Most of the new thinking on economic development will focus on how African countries will gain from the advantages that China presents and from the lessons of its development path. The author is a student at ISSCAD and a former assistant minister for international cooperation at Liberia's Ministry of Foreign Affairs.